A motivational and behavioural speaker who overcame his own life-changing accident to educate others has been handed RoSPA’s top award for individuals, the Archangel Award. In 1993, at the age of 24, Jason Anker, of Newark, Nottinghamshire, was working for a construction company when he fell 10ft from a ladder. He had fractured his back, and he was paralysed from the waist down. The effects of the accident were wider than the physical injury, having had an impact on both his family life and his mental health. But Jason overcame the many difficulties caused by the incident, and today tours the country to share his experiences and advice, in the hope that he can prevent anyone else going through what he suffered. Jason now works as a motivational and behavioural safety speaker for his own organisation, Proud2bSafe, giving talks to industry about his experience of living as a paraplegic and the story of his life before, the day of and after the accident. In recognition of his efforts, Jason was handed the RoSPA Archangel Award at a gala dinner at Birmingham’s Hilton Metropole last night (July 13). 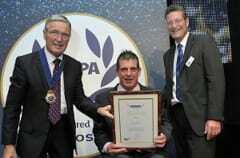 The RoSPA Guardian Angel Awards scheme recognises individuals who go above and beyond to improve the safety of others. Errol Taylor, RoSPA’s chief executive, said: “Jason’s struggle and rehabilitation left him unable to talk about his experience for many years. “However, the decision to speak openly to others about his experience led to an outstanding ability to communicate the importance of safety in a raw, engaging and emotional way. He speaks about the importance of safety in a way that engages even the most hardened worker on why it matters, along with mentoring others with similar experiences to do the same. Further Guardian Angel Awards presentations took place in London in June, with more in Glasgow in September, and form part of the annual RoSPA Health and Safety Awards.